Apart from, "how do you achieve that flawless beach wave look?" the question I'm asked most is, "How can I live in Ireland, too?" This is, of course, a natural question because Ireland is stunning, the people are warm, the culture vibrant and the accents dreamy. I've loved the idea of Ireland all my life, without ever imagining I'd find myself spending the majority of my 30s on her distant shore. And when we felt ourselves being led in an easterly (and green, in every way) direction, getting here was nothing short of miraculous. And staying here has been nothing short of harrowing. This is how we came to live in Ireland: A few years after getting married and working in the traditional marketplace, Matt and I started dreaming of the possibility of serving in Christian ministry overseas. In Christianese, we "felt the call." This was 2003. At the time, with one baby in tow, we weren't sure if we could swing a lifetime in another country, so we narrowed down our destinations to English-speaking countries and searched organisations who were placing people on a short-term basis to work with young people, music and carpentry. 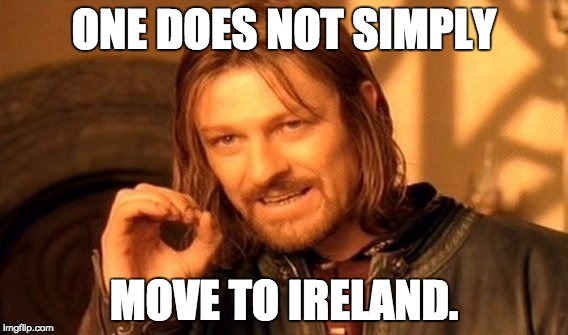 In the end, Ireland was a perfect fit for us. After a year of applications and interviews, we became employees of a US-based Christian sending agency from which we are paid a salary. That salary, however, is all raised beforehand, and we spent pert-near four years raising it (the EU is expensive, ya'll!). If you're still counting, that's five years of prep work before embarkation. We lived in County Meath for two years, relocated back to the US in order to raise funds so we could return to Ireland long-term (this particular home assignment lasted over two years) and finally moved back to Dublin in January 2013. We have an amazing team of people who donate to our organisation so that we can afford to live and work in Ireland as ministers of religion. This is our particular visa stamp and it means we partner with churches, other faith-based orgs, and non-profits like Serve the City. I don't love that specific title (religion is not a word used lightly round these parts), but it enables us to do what we feel God has called us to do (serving through the local church, the arts and community development). We do not have work visas to live in Ireland, though many of my expat friends do (or are attached to one through their spouse). Our visa actually requires we don't work, that we are not reliant on the State in any way, that we bring enough of a salary from the US to support ourselves and our children, that we have private insurance and are attached to a known agency to fulfill a specific purpose. And of course, as we've learned over the course of these last few years, this visa can only be renewed for a maximum of three years (more on that later). Our story is not indicative of everyone's, but it is similar to the journey many of our friends and coworkers have walked/fought to live in Ireland. Apart from a visa like our own, one must have a valid work visa supplied by a specific employer, be seeking refugee or asylum status, or be the owner of the golden ticket - an EU passport - to move to Ireland. And even though these are all viable and oft-used options, the qualifications are stringent. In other words: we are not entitled to live in Ireland; it is a gracious gift (with terms). On Monday, I'll share a little more about those terms, but for now, lemme know if I've got it all wrong or if you have a burning question about visas, sendings orgs or my beachy waves. PS - Here's the follow-up.